Travel north on the trail to the Lock 12 Museum and Station Master’s House. Tour lead by a representative from the East Coast Greenway. There is a place for everyone in New Haven’s school system. This ride will take you from public, private, charter, regional, to home schooling programs. Ride to visit sites where climate adaptation and mitigation is on-going in the form of green infrastructure and use of solar panels. Review areas threatened by climate changes due to the rise in sea level. See how climate change impacts low income neighborhoods. Finally, where mitigation could happen and plans to implement soil carbon capture, school based climate education, and instituting more climate friendly infrastructure. Get your hands dirty with local business that encourage you to explore your creative impulses. Bring your appetite for a bike tour picnic extravaganza. Visit local food suppliers and see where your food originates and collect your perfect meal. A picnic in a local park concludes the ride. Did we mention ice cream? To Silver Sands Beach in Milford. Tour lead by a representative from the East Coast Greenway. Ride to Hindinger Farm in Hamden for the annual festival of strawberries. Events include family hayrides, fun clowns, lots of food and entertainment. Celebrate the end of slavery and visit New Haven’s sites on the Freedom Trail. The Mill River provides sustenance, commerce, and recreation for its residents. Learn how current initiatives planned for the river will enhance daily life in New Haven. Part scavenger hunt part clue fest, decipher clues and collect pieces of the puzzle hidden throughout New Haven. Prize awarded. It all started here 150 years ago. Travel back in time and trace the history of bicycling. The Wheelmen will demonstrate their antique bicycles and provide a robust cycling experience for all to enjoy. Ride to the Valley for bicycling celebrations in Derby and Ansonia. It all started here! 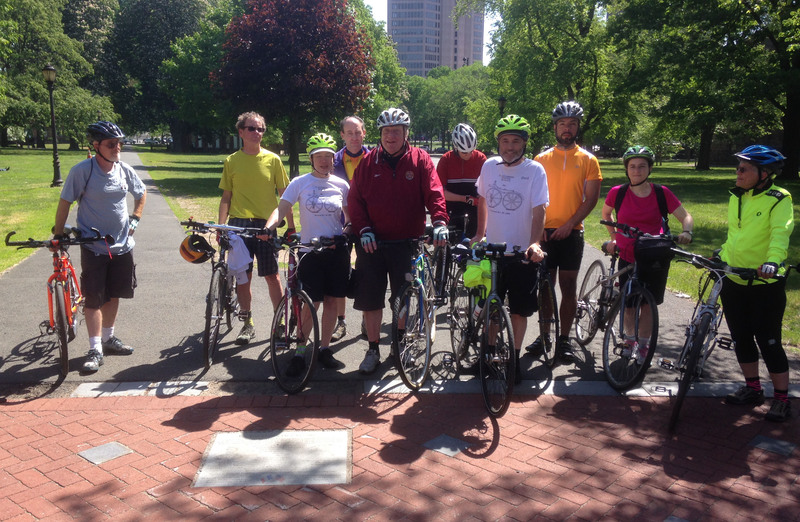 Ride with the Wheelmen and explore bicycling history in New Haven. Best Western Hotel, 201 Washington Avenue (Route 5) North Haven, CT.
2:00 -5:00pm Lectures open to the public covering bicycling in America: Hobby Horse era, Velocipede era, High Wheel era, early safeties, and contemporary. This entry was posted in Uncategorized by elmcitycyclingwebsite. Bookmark the permalink.